Michigan Attorney General Bill Schuette asked an Eaton County court Monday to shutter abortion clinics in Lansing and Saginaw that he said have been operating in violation of state law. The two clinics, owned by Womens Choice Clinic of Lansing, have been under scrutiny for more than a year since someone associated with an anti-abortion organization recovered fetal remains from a trash bin behind the Lansing clinic. In the complaint filed Monday, Schuette said the clinics were in violation of state law because they were not incorporated by a medical professional. In the complaint filed Monday, Schuette said the clinics were in violation of state law because they were not incorporated by a medical professional. He asked the court to order the operations to shut down and to prohibit Richard Remund, the president of Womens Choice, from organizing another company to operate an abortion clinic. 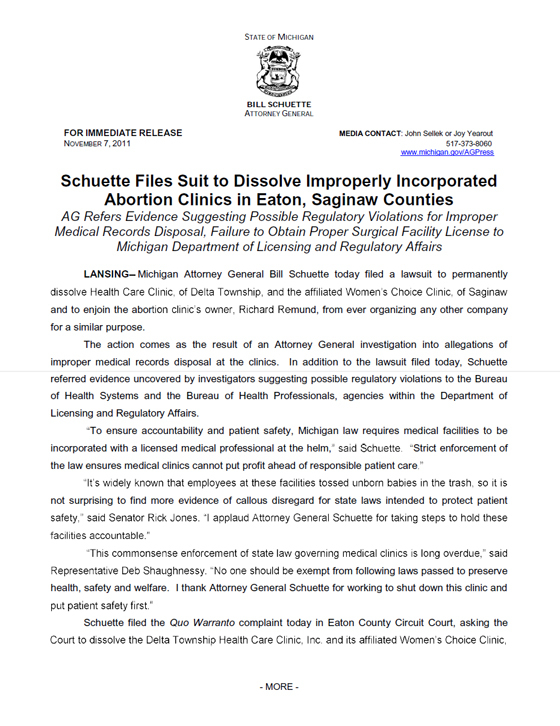 The clinics also appeared to have improperly disposed of medical records, Schuette said. A woman answering the phone at the Lansing clinic, which also is listed as the corporate headquarters of Womens Choice, declined to comment. 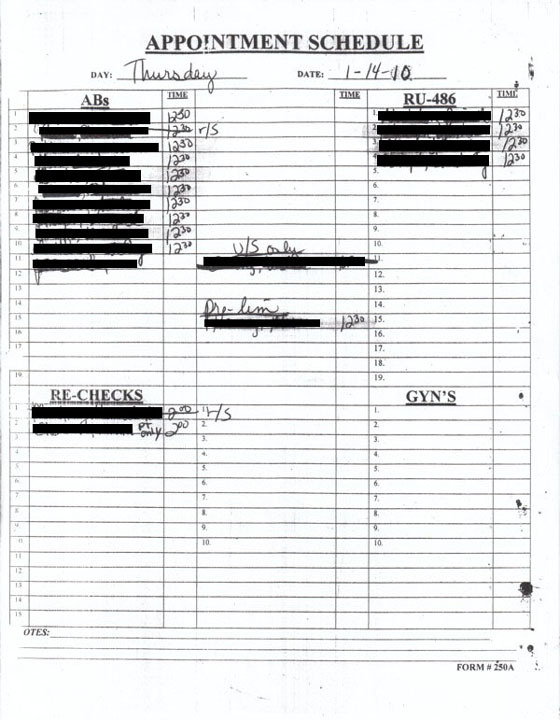 An attorney listed in corporate records as a representative for Womens Choice also declined to comment. The Lansing clinic was targeted by the group Citizens for a Pro-life Society in February 2010 after an activist discovered what he said were the remains of 17 aborted fetuses in a trash bin behind the clinic. 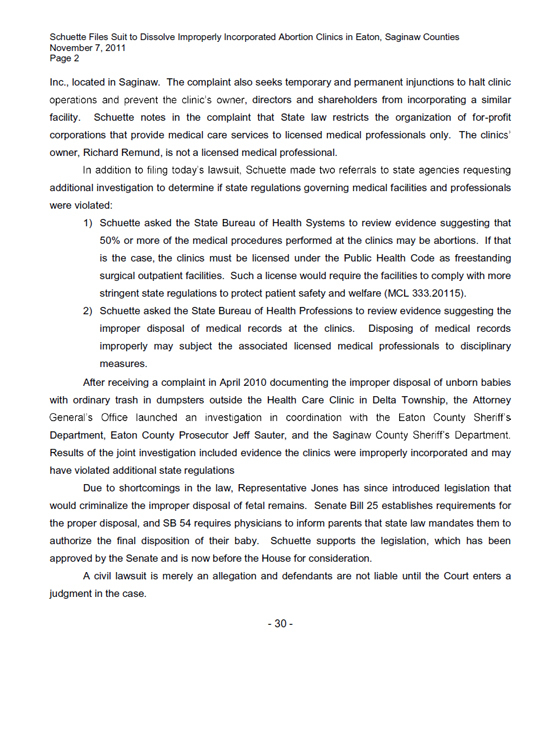 A subsequent investigation by state and local officials determined that the disposal of aborted remains as ordinary waste was not illegal, but also triggered follow-up investigations that led to the complaint filed by Schuette. On October 22, 2010 The Michigan Attorney General, and the Eaton and Saginaw County Sheriff Departments completed a 7 month-long investigation of the Womans Choice abortion clinics located at 6500 Centurion Drive, Ste. 290, Lansing and 3141 S. Cabaret Trail, Ste 400, Saginaw, Michigan—owned by Florida resident Richard Remund.